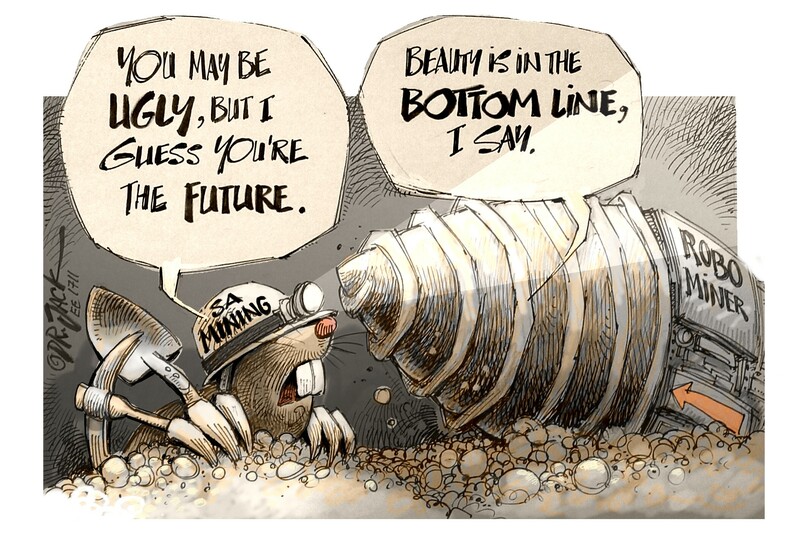 Eskom’s road to sustainability will be long, hard and painful. The power utility is facing severe challenges financially and operationally. The risk of load shedding in the coming months remains fairly high; the cost of keeping the lights on will further impact financial performance; and tough decisions are necessary to achieve full recovery. That’s the message from the power utility’s chairman. 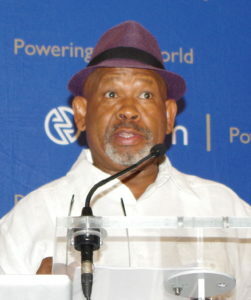 Speaking at Eskom’s recent group interim results media briefing, Jabu Mabuza, the power utility’s chairman, said that the challenges facing Eskom are deep-seated and complex. He said that the utility is facing serious financial liquidity problems brought about a combination of low tariffs, a decline of 0,8% in sales volumes year-to-date, increases in primary energy and employee benefit costs, plus the continuing new-build programme. At the same time, Eskom is also facing reduced generation performance, low coal stock levels, and large increases in municipal arrear debt. Mabuza said that he would employ ethical and prudent methods to run the organisation, and that irrespective of what had transpired in the past to bring the institution to its current position, the board must now focus on executing strategies which will constrain the entity’s costs and improve its reputation in the eyes of both investors and consumers. There are three major costs which need to be addressed: Primary energy, people and debt. To this end, he said, the organisation has selected five key priorities to create a platform for future growth. These include addressing poor governance and controls while improving financial liquidity. Revenue growth: Drive short-term growth with pricing incentives. Primary energy optimisation: Grow cost-plus mine volumes and reduce costs. Operating model: Ring-fence different sections of the business to more accurately determine profit and loss areas. Cost efficiency: Launch operational improvements in Generation, Transmission and Distribution divisions. Capital effectiveness: Prioritise capital expenditure controls and apply lean design principles. Mabuza said that Eskom’s problems are too big for Eskom to solve on its own. It will need the cooperation and support of Government, consumers, its employees, consumers and suppliers if it is to succeed. “If we do nothing, we’ll soon speak of Eskom in the past tense”, he said. Executing the strategic plan – which is part of the larger plan to 2035 – should result in a R30-billion saving over the next five years, he said. Phakamani Hadebe, the organisation’s chief executive officer, said that the utility, which has assets worth R800-billion, is currently saddled with a debt-load of R419-billion (compared to R367-billion in the same period last year) which could balloon to R600-billion within three years. As things stand, Hadebe said, the power utility is not sustainable. Gearing has increased from 72% to almost 76%; sales growth is too low (at 0,8%); reduced generation performance has necessitated the more frequent use of expensive-to-run diesel-powered open cycle gas turbines (OCGTs) to meet demand; and the ever-increasing overdue municipal debt now stands at R17-billion. Eleven municipalities owe Eskom R11-billion. 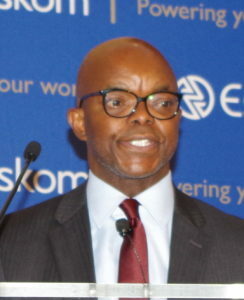 When asked about the minimum amount by which Eskom’s debt burden needs to be reduced, Hadebe said it would depend on the tariff determined by Nersa. Eskom has asked Nersa to approve tariff increases of 15% per annum for the three years between 1 April 2019 and 31 March 2022. If granted, this would result in a rise in the standard tariff from the current R0,94/kWh to R1,43/kWh by March 2022. Problems associated with the supply of coal to the power stations have exacerbated operational challenges and have resulted in many power stations having inadequate coal stocks. Problems with coal include poor quality coal; the high price of coal on world markets – resulting in some mine companies preferring to sell their coal overseas than to Eskom; and insufficient investment, by Eskom, in cost-plus mines which limits their ability to supply the quantities of coal Eskom needs. To address these challenges, the power utility has decided to purchase an additional 4 Mt of coal, increase its diesel stock to ensure that the OCGTs are always available, and to keep the upper dams of its pumped water storage systems full at all times. The power utility has budgeted an additional R750-million to R1-billion for this. The issue of low stocks of coal, together with an unacceptably high percentage of unplanned outages (12% of total generating capacity) has reduced the availability factor of electricity (EAF) from 75% in October (it should be between 78 and 80%) to under 70% in November. Although Hadebe stressed that load shedding was a last resort, the lower the EAF goes, the higher the risk of load shedding becomes. Both he and Mabuza said that the risk of load shedding remains fairly high. Load shedding helps the utility to make less use of its expensive-to-run diesel-powered OCGTs because the cost of operating these generators is higher than the income derived from the sale of electricity. Calib Cassim, Eskom’s newly appointed chief financial officer, said that the utility needs higher-than-inflation tariff increases for the next few years to improve its cash-flow. He said that the Multi-Year Price Determination (MYPD) allowed by the energy regulator (Nersa) of R32-billion will be applied to the tariff from 1 April 2019. Income has increased marginally from R22-billion to R26-billion. 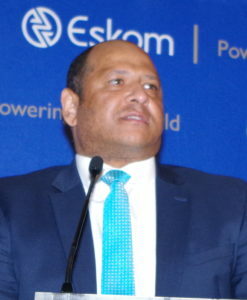 However, the price of coal has increased year-on-year by almost 12%; municipal arrears debt has increased to R17-billion; cash required to service debt has almost doubled from R23-billion to R45-billion – although this includes the repayment of a R20-billion bridging loan which had been provided by local banks in February to address the utility’s liquidity crisis; and interest on the power utility’s loans has gone from R10-billion to R13,7-billion, he said. According to Cassim, the power utility’s cash position has declined from R17-billion in September to R11-billion in November. As things stand, although the power utility originally expected to end the 2018 financial year (on 31 March 2019) with a loss of R11-billion, it now seems likely that the figure will be closer to R15-billion. Fig. 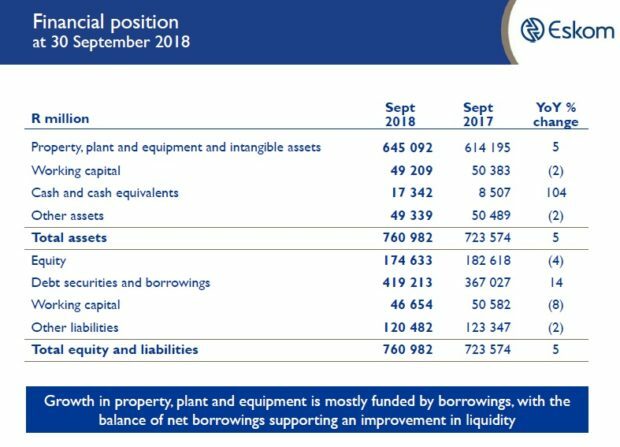 1: Balance sheet as at 30 September 2018. Fig. 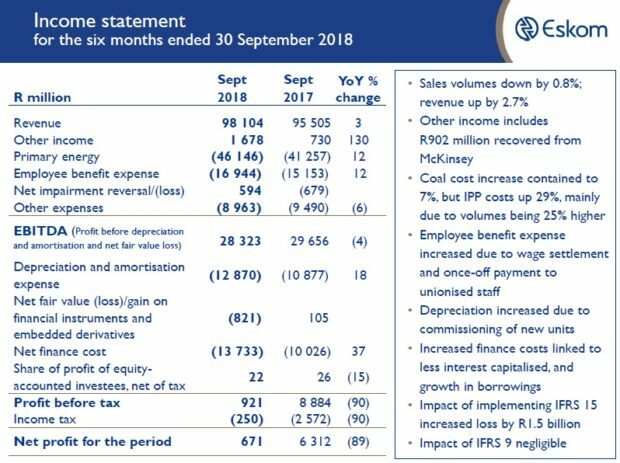 2: Income statement for the period ended 30 September 2018. Fig. 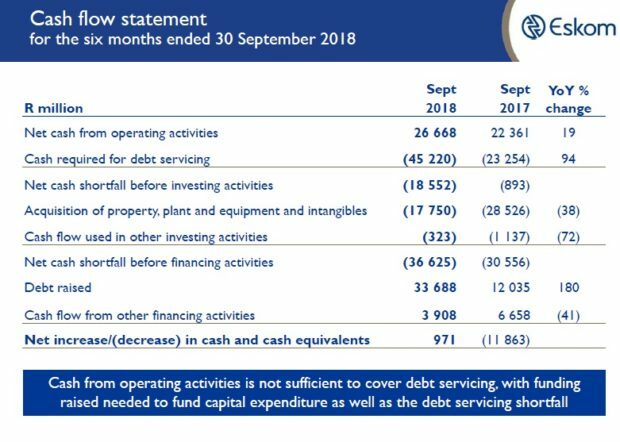 3: Cash flow statement for the period ended 30 September 2018. 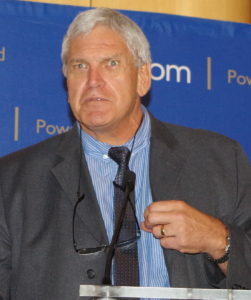 Jan Oberholzer, Eskom’s chief operating officer, said that while operational performance in the Generation division is below acceptable limits with growing unplanned maintenance (resulting from failures and breakdowns) resulting in ever-decreasing EAFs, the Transmission and Distribution divisions are performing well. He said that between 59 and 62 outages for maintenance are planned for the period until December 2019 to keep the assets operating properly. Regarding coal stock, Oberholzer said that the power utility has an average of 25 days of coal supply on hand. This is down from the 40 days it had in September. New contracts for coal will increase the number of days held to 26 by 31 March 2019. Poor operational performance, the increase in unplanned maintenance and the problems related to the unavailability of high quality coal in the quantities – and at the price Eskom is prepared to pay – means that load shedding may be with us for some time yet, Oberholzer said. In answer to a question regarding Eskom’s coal-fired fleet failing to comply with the emissions limits set by the Department of Environmental Affairs, Oberholzer said that the utility could not afford to spend the money needed to bring those stations to compliance. The decision was, therefore, to keep applying for exemption – and keep polluting the air around those power stations – every year until they are taken out of service. That, however, won’t happen for the next ten to 15 years, he said. Despite the challenges facing the utility, the Board is apparently confident that Eskom is still economically viable, albeit not in a sustainable form. The utility will have to implement a number of mitigating strategies and actions to address the apparent risks. The turnaround of Eskom is a journey over time which is highly dependent on active involvement by the shareholder, Nersa and other stakeholders. It is clear that Eskom cannot solve its financial and operational sustainability challenges alone: the shortfall in tariff cannot be solved through cost reductions alone, and further indebtedness adds to the problem. 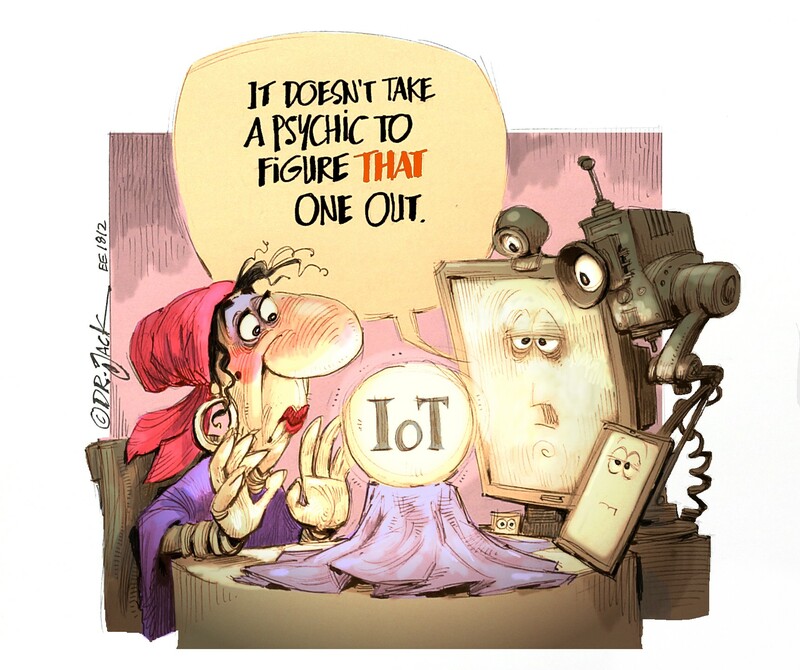 Ultimately, the solution will impact either the electricity consumer or the taxpayer. It seems that the future of this enormous organisation lies in the balance. As tariffs increase, or electricity supply becomes less-dependable (through load shedding), consumers may well decide to look for alternative sources of energy. This will result in a further decrease in electricity sales and will only add to Eskom’s sustainability problems, possibly even bringing about the long-predicted utility death spiral.